If you are in town on a Saturday from April through October, begin your day at the Saturday Farmer’s Market on Bentonville Square. Vendors sell everything from coffee to delicious pastries to every imaginable type of produce. The market also features chef demonstrations and live music. Other days of the week, check out The Hive at 21c Museum Hotel, and if you are a morning coffee person, be sure to grab a coffee at the Pressroom or Kennedy Coffee. Once you’ve had a bite to eat, rent a bike at Phat Tire right off the square. Take a bike ride on some of the amazing trails around the city. Rentals include a helmet, a quick fit and suspension set-up, flat pedals, SPD, Crank Brother, SPD-SL, or you can BYOB… Bring Your Own Bike! After your bike ride, come back to the square and grab some lunch at the Station Cafe, famous for its delicious burgers, or hit the Crepes Paulette food truck. 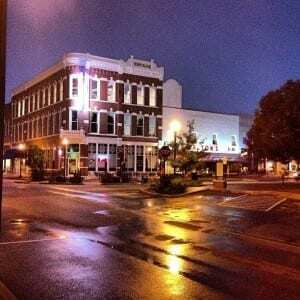 Browse the art galleries around the square in the afternoon or visit the Walmart Museum, which shows the history of the big box giant and its founder, Sam Walton. Take a walk on one of Bentonville’s beautiful walking trails. There are 3.5 miles of trail around and through the beautiful 120-acre Crystal Bridges Museum of America Art site. Round out your day with dinner at Fred’s Hickory Inn where you will sample some of the best smoked barbecue you’ve ever put in your mouth!